Having attended Shen Yun performances at the Kennedy Center in Washington, D.C., I was well aware of what I could expect at Carnegie Hall in October. A top-flight performance by an excellent group of artists whether musicians, dancers, composers, or set designers. A packed audience full of fawning enthusiasts, curious onlookers, and music-arts aficionados. Although Master Li Hongzhi’s exact role in Shen Yun has never been quite clear, his surprise mention in the 2015 Playbill as “D.F., Artistic Director” signifies an increasingly public role. In fact, no one disputes the role which tranquil spiritual music plays in supporting Falun Gong meditation practice. All the exercises are enhanced when done in accompaniment with the oriental music as designed and taught by Master Li Hongzhi in accordance with the lectures. However since the persecution started in Communist China, there have been arrest warrants and Master was even forced to retract his autobiography. Thus, aside from what the public can glean from Wikipedia or elsewhere, Master Li’s personal life and biography remain an enigma. That he can boldly come out under pre-arranged circumstances for lectures, media appearances, and teach or presume responsibility for Shen Yun means that he either is unafraid or yearning for formal recognition in his role as one of the founders of Shen Yun. Naturally as cultivation followers and even more naturally as skeptics, people will question both his qualifications and how he has had the time for such involvement. My own investigation into this matter bears forth that Master comes from more humble beginnings and there is great speculation on whether or not he even came from a single-parent household, his exact birth date, when he married, and how many children and relatives he has. According to Master, none of this has anything to do with Falun Gong teaching practice. Indeed, the bulk of today’s Falun Gong international practitioners can care less about the mundane details of Master Li Hongzhi’s life. Cultivators coming from all walks of life frequently learn on their own, and are drawn to self-cultivation due to circumstances that range from desperate to certain predispositions. For instance, we are searching for deeper meaning in life or hoping to modify our behavioral patterns. That the practice actually helps or works is evidenced by ample worldwide testimonies, certain signs or miracles, or the growing sense of compassion, truth, and forbearance within oneself. In fact, natural skeptics might doubt whether Master Li Hongzhi operates singly or in fact with a hidden circle of his mentors and fully awakened apostolates. My belief is that he cannot possibly be fully acting on his own, and that the idea that he is a persona reflected from a higher being operating in several different dimensions may be credible. Despite the denigrating comments by the CCP that Master Li lived through a series of mundane low-key positions, there is also the fact that Li grew up in times when the only real education to be had was acquired on one’s own. Times were either too unstable or the communists too committed in systematically displacing the intelligentsia and replacing them with party members on sinecures. Thus the best traditional education that the country could have afforded may very well have been located outside of Beijing and in the northeast region where Li grew up. In other words, Master Li Hongzhi consistently emphasizes that Falun Gong adherents (Dafa disciples) refine themselves in cultivation by cultivating their minds and hearts while working among ordinary people. It could be for this reason that the founder of Shen Yun uses the moniker of “D.F.” as Artistic Director in order to emphasize his role as a DaFa disciple himself. If this is the case, then one would say that this self-effacing quality of Master is entirely consistent with the tone and perspective evident in the Lectures (Falun Gong or Zhuan Falun). He knows that he is himself accountable in his role as an ordinary person in the ordinary world, yet the time has come to publish his name as someone who has made manifold contributions from providing the design and inspiration, to contributing to Shen Yun’s compositions. Using a Western symphony orchestra to present and revive China’s authentic traditions is not a simple feat. It involves interpreting Chinese musical styles on Western musical instruments. This requires remarkable versatility on the part of the performers (conductor and instrumentalists), informed imagination on the part of the composers, and rigorous collaboration on the part of all musicians involved. In the overall context, “D.F.” emerging to take artistic credit is consistent with the rigorous accounting routines of the post-modern era, in which worldly value and quality of human life figures too often in collusion with prestigious degrees. Shen Yun’s founder may be pursuing a pragmatic path towards academic accreditation even while this may surprise practitioners who embraced the stereotype of the hail-fellow-come-worthy background of Teacher. Others who are brought up on concepts such as forced separation between church and state may also feel confused about the commercial enterprise. It may be that Shen Yun recognizes that its reputation is based upon a stronger institutional footing especially since Fei Tian Academy graduates are more frequently recruited to train with Shen Yun. Generally today’s saints and top-flight musicians do not necessarily require doctorates any more than this country’s earliest diplomats, Harlem poets, or the well-trained and disciplined ancients. Yet in Manhattan, fraught with its competitive environment among those who have been discovered versus those still waiting in the wings, there’s no doubt this is a factor. The question is whether Shen Yun’s pursuit of recognition may lead to spiritual malaise. Will the world’s top Buddhist lawyer and advocate flounder when he receives his Ph.D. judgeship and lapel pins, as so many other former greats? Recently the world has witnessed Nobel Peace prize winners transformed into war advocates, literary writers caught permanently in their own swinging pendulum, and scientists found oft quoting on subjects as if they were classics sages. Must we witness this conversion or contamination if “D.F.” ascends into the academic spheres? One thing is for certain. A figure as venerated and popular a world spiritual leader as Master Li Hongzhi cannot be without detractors, skeptics, or those hoping to stir up controversy. Even if Master did not come out as the founder of Shen Yun, there are those who wonder about his personal life. His followers must necessarily include those who confute the man for the model, much like any other popularly elected politician or even the Pope. Their personal lives are necessarily a matter of public accounting, like it or not, because we all must live ordinary lives. Yet the subterfuges of the CCP in its provocations against Falun Gong or Shen Yun can never be discounted. Even now, China Daily awards media publicity for imitative Shen Yun companies such as Impressions of Western China. The CCP has not released all its Falun Gong prisoners in detention camps nor has it ever formally apologized. The only reason why Shen Yun and Falun Gong are better tolerated is precisely because of the international media publicity established by enterprises such as New Tang Dynasty Television and Epoch Times newspapers. Even now, Master Li Hongzhi cannot risk appearing in China on tour for Falun Gong Lectures. Shen Yun continues to be banned from the mainland, and it’s venues are routinely trolled on crowd-sourced review websites (such as Yelp). Both westerners who are religiously biased and easterners who are under the influence of party leaders are eager to label Falun Gong as a cult. As far as the Great Way having no form, it seems that we may not have time to revisit that topic…Your cultivation does not take any particular form… But you will return to your various jobs when you go back home… but those are merely companies that conform to ordinary people’s ways; those companies themselves are not part of our cultivation… Those are not some set forms that Dafa cultivation specifically takes. There are no companies in Dafa. That applies to Shen Yun as well, which is also a project established by Dafa disciples to save people, and not some specific cultivation method or environment that requires Dafa disciples to cultivate in that specific way. Perhaps Master Li Hongzhi should realize that some people are more interested in recommended articles, conference sharing, and his ability to answer cultivation questions than in his stately appearance in the role of Buddha in a dance scene at Shen Yun. Not that we don’t already venerate him; it’s just that in some minds, we may relish a separation between art and reality. After all, time and again, Zhuan Falun emphasizes “picking oneself up by one’s bootstraps” by cultivating oneself and returning to the origin or “one’s true self.” There is a selflessness in Buddhism that encourages helping humankind “take a fresh look at itself and at the universe, changing its rigid way of thinking.”  While the audience is invited to contemplate life and art, Dafa practitioners might well be stuck contemplating the ambiguity of enlightenment. 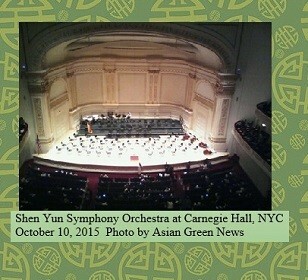 “Shen Yun Symphony Orchestra,” Playbill, ibid. “Shen Yun Symphony Orchestra — The Artists,” Playbill, ibid.